Project obstacles and solutions: As part of the 100th running of the Indianapolis 500, the entrance to the raceway off of Georgetwon Road and 16th Street was rebuilt with a black and white checkerboard hardscape. F.A. Wilhelm was awarded the contract for this job. This project involved brick pavers and colored concrete. Each concrete square was formed up and poured separately from the square next to it. 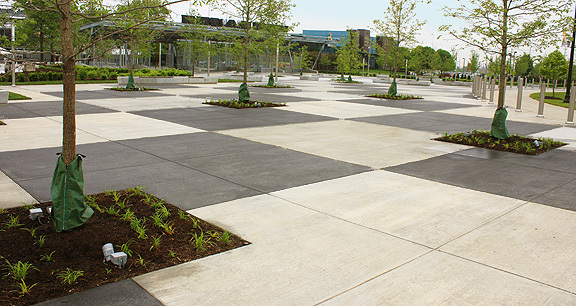 For the black checkerboard sections, IMI used a dark onyx color mixed integrally with the concrete. This project was on a very tight deadline and had to be completed in time for the opening of the 500 track to the public in May. That required the concrete squares to be poured in freezing conditions during the winter. Typically concrete is covered with warming blankets to protect it from freezing temperatures. However, with color in the concrete, this option was not available. IMI QC/QA used a Type III Portland cement in the mix to get a high early strength. They also added a mid-range water reducer. Wilhelm placed a tent over each of the squares as they cured. This protected the concrete from freezing and sped up curing time. It allowed the Wilhelm crews to break down their forms within 24 hours and move on to the next set of squares despite cold weather. IMI supplied a total of 2,250 yards for the Legends Plaza hardscape project. For more information on coloring concrete, click here. For information on gaining early strength, contact the sales representative for the plant nearest your location. Click here.